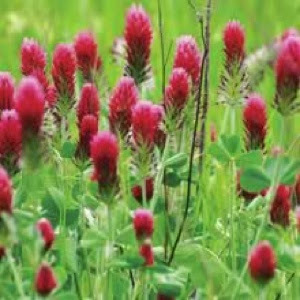 My Home and Garden: Is anyone familiar with Crimson Clover?? I have loved clover all of my life. I just spotted this in the Westcoast Seed catalogue under Cover Crops. I don't know if it would look really wonderful or God Awful. Maybe I could try a little test area in the he back yard. Yeah, that sounds like a plan. Would still love to know how clover worked out for you though. I did buy a plant many years ago..it was beautiful..large large flowers and leaves as well. Didn't thrive and gave up after two years. I quite liked it though. If it's the same variety I don't know. I never thought of that Mark. I am going to contact WCS and see what they say. Thank you.